(Photo: REUTERS / Gleb Garanich)A woman reacts as she stands near the entrance to a burnt trade union building, the site of recent street battles between pro-Russian and pro-Ukrainian supporters, in the Black Sea port of Odessa May 4, 2014. KRAMATORSK/ODESSA, Ukraine, May 6 (Reuters) - Both sides have been burying their dead as Ukraine slides further towards war, with supporters of Russia and of a united Ukraine accusing each other of tearing the country apart. It was generally quieter on Tuesday than past days in most of eastern and southern Ukraine, but violence flared at dusk in the eastern port of Mariupol, where a spokesman for pro-Moscow militants told Russia's Itar-Tass news agency that one person was killed and three wounded in an attack on a checkpoint. In Kramatorsk, a separatist-held town in the east that saw an advance by Ukrainian troops at the weekend, the coffin of 21-year-old nurse Yulia Izotova was carried through streets stilled by barricades of tyres and tree trunks on Monday. Scattered red carnations traced the route. At the Holy Trinity Church, seven priests led mourners in prayer for a woman killed by large-calibre bullets, which the townsfolk believe were fired by Ukrainian troops. "They shoot at us. Why? Because we don't want to live with fascists?" asked 58-year-old passport photographer Sergei Fominsky, standing with his wife among the mourners. "We're not slaves. We kneel to no one." In Odessa, a previously peaceful, multiethnic Black Sea port where more than 40 people were killed on Friday in the worst day of violence since a February revolt toppled Ukraine's pro-Russian president, pall-bearers carried Andrey Biryukov's open casket from a van to the street corner where he was shot. A pro-Ukrainian activist, Biryukov, 35, was killed during a day that began with hundreds of pro-Russian sympathisers armed with axes, chains and guns attacking a Ukrainian march, and ended later that night with the pro-Russians barricaded inside a building that was set on fire, killing dozens. A small crowd of about 50 people stood around the body, covering it with carnations and roses. A Ukrainian flag fluttered in the wind, and a patriotic song about dead heroes was played from a sound system. Relatives wept and a young woman fell on her knees crying loudly. The corner where the man died was decorated with flowers and small Ukrainian flags. "The government has failed to protect its own people. The police have failed miserably," said Nikita, a grizzled 56-year-old with a Ukrainian yellow-and-blue arm-band. Sergei, in his 40s, who also came to mourn, said violence "was imported to Odessa". "We were proud of Odessa as a unique place where people used to live in peace, regardless of their beliefs and religion and race," he said. "Now this is all gone." In Mariupol, the main port for the eastern coal and steel region of the Donbass, pro-Moscow militants told Russian news agencies that one of their checkpoints on the outskirts was attacked late on Tuesday - by Ukrainian forces or by pro-Kiev militia - and they were preparing to repel further assaults. Local website 0629.com.ua posted pictures of tyres blazing outside the city council building and thick smoke pouring over the town centre. Some streets were barricaded by buses. The surge in violence has changed the tone of international diplomacy, with even cautious European states speaking increasingly of the likelihood of war in a country of around 45 million people the size of France. "The bloody pictures from Odessa have shown us that we are just a few steps away from a military confrontation," German Foreign Minister Frank-Walter Steinmeier said in interviews published in four European newspapers. The next few days could prove decisive: separatists in the Donbass region say they will hold a referendum on secession on Sunday, similar to the one that preceded Russia's annexation of Crimea in March. In Washington, U.S. Secretary of State John Kerry denounced any attempt at a vote as "bogus," saying: "We flatly reject this illegal effort to further divide Ukraine. "This is really the Crimea playbook all over again, and no civilized nation is going to recognise the results of such a bogus effort," he said in a news conference with EU foreign policy chief Catherine Ashton. He again cautioned Moscow that Washington would impose more powerful sanctions designed to hurt Russia's economy if it tried to disrupt Ukraine's presidential election set for May 25. Kerry suggested, however, that moving too soon on tougher sanctions before diplomatic efforts have been fully explored could backfire. He said he would meet ministers in Europe next week to discuss the next steps on Ukraine. Western concern so far has not been matched by any serious action that might dissuade Russian President Vladimir Putin. The United States and the European Union have imposed limited sanctions on lists of individual Russians and small companies, but have held back from measures designed to hurt Russia's economy broadly. Nonetheless, a senior Finance Ministry official in Moscow said Russian GDP could shrink again this quarter. NATO has made clear it will not fight to protect Ukraine, instead beefing up defences of its nearby member states. NATO's top military commander, U.S. Air Force General Philip Breedlove, said on Tuesday the alliance would have to consider permanently stationing troops in parts of Eastern Europe because of the increased tension between Russia and Ukraine. Breedlove, who said on Monday he did not think Moscow would send troops into eastern Ukraine, stressed the steps that NATO had taken so far were designed to support Eastern members of the alliance. "We are taking measures that should be very easily discerned as being defensive in nature. This is about assuring our allies, not provoking Russia, and we are communicating that at every level," he said in Ottawa. Two days before the separatists' referendum is Friday's annual Victory Day holiday celebrating the Soviet Union's triumph over Nazi Germany. Moscow has been openly comparing the government in Kiev to the Nazis, and Ukrainian officials say they are worried that the day could provoke violence. In Moscow, there will be a massive parade of military hardware through Red Square, a Soviet-era tradition revived by Putin. The past few days have seen government forces press on with an offensive but make little progress in the east, where separatist rebels have so far held firm at their main outpost in the town of Slaviansk and shot down three Ukrainian helicopters. Interior Minister Arsen Avakov said on Tuesday more than 30 separatists had been killed in fighting around Slaviansk, but there was no confirmation of such a figure. The rebels, who triggered fighting in the area on Monday by ambushing government troops, said four of their number had been killed. At roadblocks in the town, some armed fighters have been replaced by civilians, like Alexandra, in her late 20s, who said she leaves her 10-year-old daughter at home each morning, puts a starting pistol in her belt and walks to the barricades. The tactic of putting civilians at the front could make a government offensive more difficult. "We have two options - to use heavy artillery ... wipe everything out, put the flag up and report that everything has been done. The second option is a gradual blockade, destroying provocateurs and sabotage to prevent injuries among the population. We are carrying out the second scenario," said acting Defence Minister Mykhailo Koval, explaining why the operation had taken so long and achieved so little. Since a pro-European government took power after the uprising that toppled pro-Russian President Viktor Yanukovich, Putin overturned diplomatic convention by declaring Moscow's right to send troops across borders to protect Russian speakers. Since Crimea's annexation, armed separatists have taken control of most of the Donbass, which accounts for about 15 percent of Ukraine's population and a third of industrial output. Moscow has tens of thousands of troops massed on Ukraine's eastern frontier. 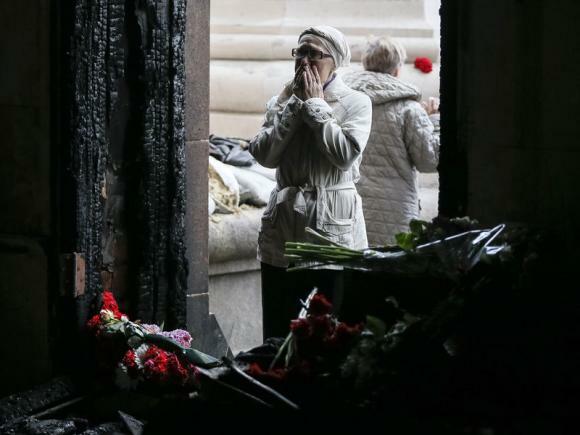 The outbreak of violence in Odessa, hundreds of kilometres away near a Russian-occupied breakaway region of neighbouring Moldova, means the unrest has spread across the breadth of southern and eastern Ukraine. Western countries say Russian agents are directing the uprising and Moscow is stoking the violence with a campaign of propaganda, broadcast into Ukraine on Russian state channels, that depicts the government in Kiev as "fascists". "Russia sometimes sounds as if it's refighting WW2. Fascism all over the place. Enemies everywhere. Ghosts of history mobilised," tweeted Swedish Foreign Minister Carl Bildt.